With over two years in development and exhaustive testing of countless prototypes, Ocean Machinery is proud to announce our latest labor saving product, the Ocean Flipper, built exclusively in the USA by Tenwin Automation. The Ocean Flipper Beam Rotator and Positioner is a simple and unique material handling component, specifically designed to fit within the material support table of the Ocean Avenger beam drill line, other single-spindle drills, or other types of steel processing equipment where turning and positioning of profiles is required. The Ocean Flipper can also be used to rotate heavy beams and columns at welding and fitting tables to speed up fitting and welding processes. The device can also rotate bundles of material in saw conveyors or other processing lines. What does the Ocean Flipper do for you? With the Ocean Flipper, the drill machine operator can rotate large and heavy beams and columns, and position them up to the datum blocks in order to drill the different sides (top flange, bottom flange and web) without the need for an overhead crane or other lifting device and without any additional labor to assist with manual flipping and positioning. To see just how simply and elegantly the Ocean Flipper performs its duties, take a look at these two videos. What is included with the Ocean Flipper? 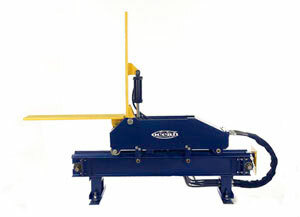 The Ocean Flipper beam turning device is a heavy duty system comprising a pair of Flipper units, an operating console that wirelessly controls the Flipper master unit, the connecting drive shaft, all hoses and connectors, and an optional hydraulic power unit (if required). If the Flipper is used in conjunction with the Ocean Avenger, the Avenger hydraulic power supply can be used, saving the customer the cost of purchasing the optional hydraulic power unit. One Ocean Flipper set, comprising a pair of rotating arms, services half of a 60’ Avenger table. Where fabricators are particularly busy, two Ocean Flippers (4 rotating arms) might make the most sense. The Ocean Flipper is sold complete with installation and training by Ocean certified installers. We will setup and calibrate your Flippers and train your operators in efficient and safe operation. What is the maximum beam or column that the Flipper can rotate and position? The Flipper is designed specifically to aid flipping and positioning of large beams and columns, including jumbo columns. What do I need to have in order to install and run the Ocean Flipper? The Ocean Flipper is designed to be a simple Plug and Play installation, done by the fabricator himself. It is supplied with the pair of arms, operating console stand, and connecting drive shaft, as well as hoses and fittings for connection to your Ocean Avenger hydraulic power unit. If you are using this with a machine other than an Ocean Avenger you will need to purchase the optional auxiliary hydraulic power unit, which comes complete with hoses and connectors. The Ocean Flipper is sold complete with installation and training by Ocean certified installers. You will need to supply masonry anchors and assorted wrenches. You will also need to purchase the hydraulic fluid if you are purchasing the optional hydraulic power pack. Ocean Flipper installed in conjunction with the Ocean Avenger CNC drill line.